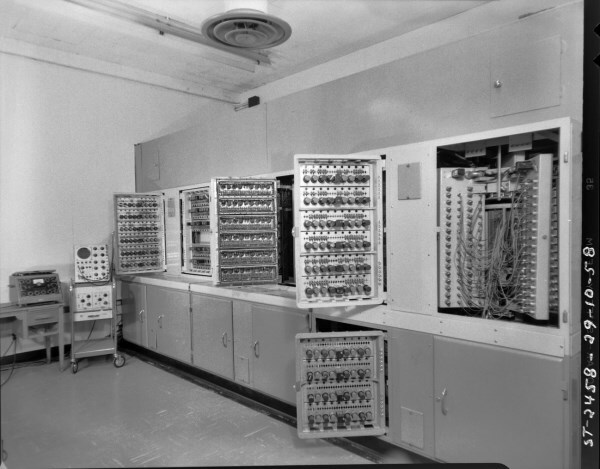 Ferut – Canada's first commercially available general purpose electronic digital computer. This site is intended as a tribute to Canada’s first commercially available general-purpose electronic computer, and the second ever sold in the world, a Ferranti Mark 1 computer called Ferut. In the spirit of full disclosure, most of the information on this site, apart from my personal recollections on this page, has been creatively researched (plagiarized) from other sources. What I’ve attempted to do is create a central repository of information pertaining to Ferut and the Ferranti Mark 1 computer. I do my best to give credit where credit is due but, quite frankly; I’ve forgotten where some of the material came from. That’s what happens when you get old. 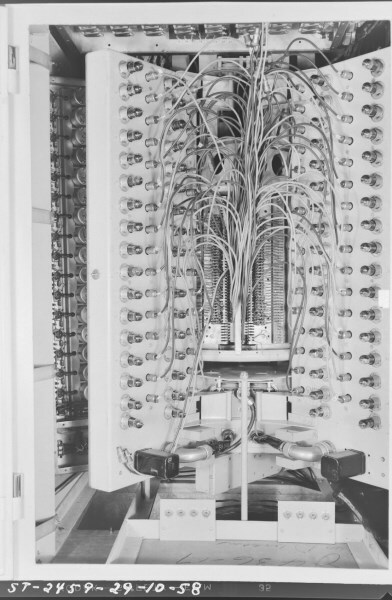 Ferut was the second of two Ferranti Mark 1 computers that were built. 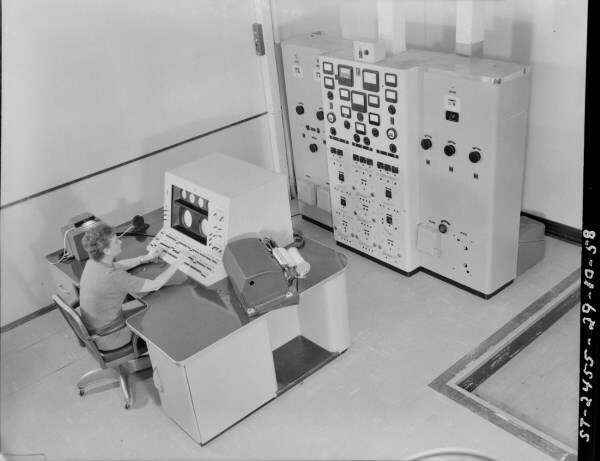 The computer was originally destined for the Atomic Energy Research Establishment in Britain. Before the computer could be delivered there was a change of government that resulted in the cancellation of any contracts over £100,000. Thus the computer became available to the University of Toronto at a fire-sale price. 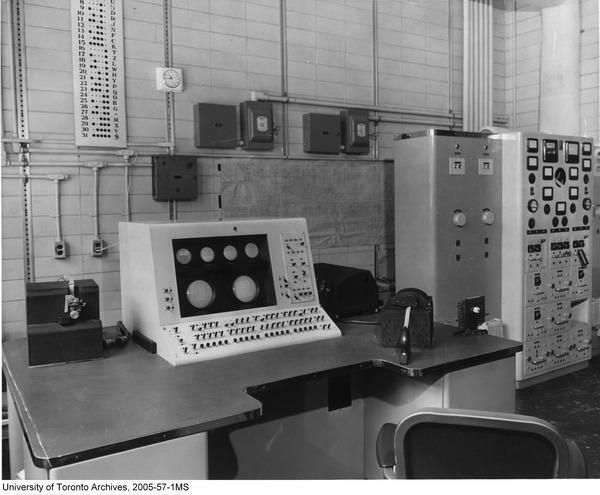 Ferut’s console and power control panel as installed at the U of T. Circa 1953. The computer was purchased for $300,000 (about $2.6M in 2013 dollars) with the assistance of grants from the National Research Council and Defense Research Board. It arrived in Toronto on April 30, 1952 and was semi-operational by September of the same year. As only the second computer ever purchased in the world and the only one in Canada. Its job was to complete complex calculations for universities and companies across Canada including such large scale projects as the design of the Saint Lawrence Seaway where the calculations were finished in record time. 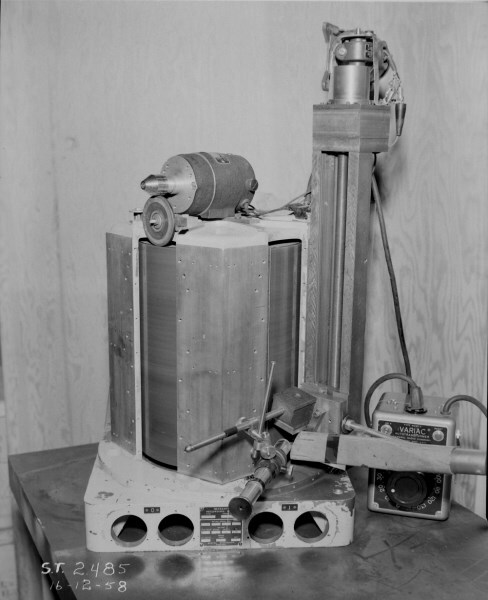 Ferut helped Toronto become the first city in the world to introduce computer-controlled traffic systems and the Avro Arrow designers used Ferut to calculate the resonant frequency of that aircraft. The computer was serial in operation, and its basic pulse repetition frequency was 100 kHz; it operated with numbers of twenty or forty binary digits, i.e. six or twelve decimal digits. 1. 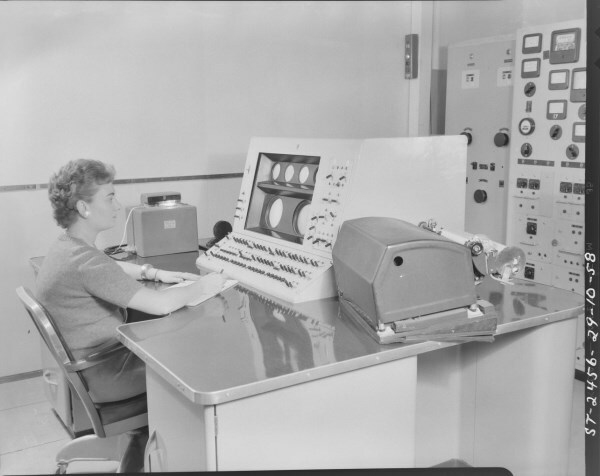 Overall dimensions: Two electronic bays each 16 feet long, 8 feet high, and 4 feet wide and a control desk containing the operator’s console. 2. Power Requirements: 27 kilowatts, provided by a pair of motor-generator sets. 3. Ventilation. The equipment bays were continuously ventilated by means of a 12 ton re-circulating air conditioning system installed in an adjacent area. 4. Number of Components. About 3600 vacuum tubes (valves), (1600 EF50 pentodes and 2000 thermionic diodes), 2,500 capacitors, 15,000 resistors, 100,000 soldered joints and 6 miles of wire. 5. Storage capacity. High speed – 8 Williams-tube electrostatic storage devices with 10,000 binary digits on cathode ray tubes; equivalent to about 3,000 decimal digits. Magnetic drum — 650,000 binary digits; equivalent to about 15,000 twelve-digit decimal numbers or 30,000 six-digit decimal numbers. 6. Input. Punched paper tape feeding in up to 200 characters per second using a Creed paper tape reader. 7. Output. Punched paper tape or direct printing by Creed teleprinter with a 6 character/second print speed. 10. Typical times for sub-routines. Square roots and reciprocal square roots: 105 milliseconds. Cosines of angles to 11 decimal digits: 80 milliseconds. Reciprocals: 95 milliseconds. Inversion of matrix of order n x n: 0.04 n3 seconds. A matrix of order 80 x 80 was now well within the capacity of the machine. 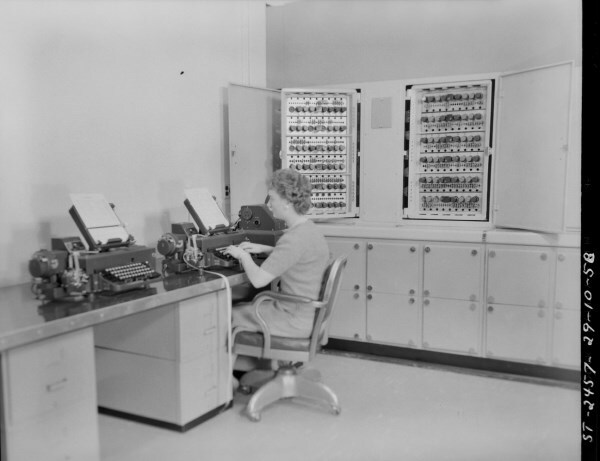 The state of the art of those early computers was advancing at the speed of light and by 1958 Ferut was outclassed by other commercially available computers. It was decided to replace Ferut with an IBM 650 which, while no more powerful than Ferut, did have the advantage of a much wider software base and easier maintenance. Ferut was shipped to the National Research Council in Ottawa where it spent its final day in M-14, the Structure Laboratory. Last Known Ferut Crew at Univ of Toronto. In early 2015, I received an email from Michael Davis whose wife Edith (then fiancee, now deceased) was a technician in the University of Toronto Computer Department, where she worked with the Ferut program paper tapes. Michael was kind enough to send me the photograph below. To my surprise, I recognized one of the people in the photograph, Stuart Baxter as being someone I worked with at NRC where he was a user of the computer. 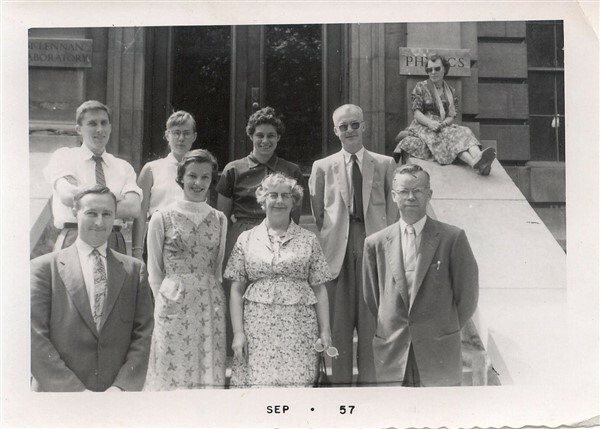 Last known Ferut crew at U of T, 1957. Front row, L to R, Dr. Stuart Baxter*, Edith (Laurie) Davis, unknown, unknown. Back row, right, Dr. David Thorp. *Postscript: Sadly, Dr. Stuart Baxter, shown above, whom I worked with at NRC in 1958-9, passed away January 8, 2017 in his 92nd year. In May of 2014, shortly after I set up this website, I was contacted by Ron Gould who had recently retired from the Structures Lab at the National Research Council. As a retirement project, Ron had digitized over 6000 B&W negatives covering activities in the Structures Lab from 1943 to 1973, some of which were of Ferut. So here, courtesy of Ron Gould and Steven Leclair of the NRC Archives, are some long-lost photographs of Ferut in M-14 at NRC. This is the view you would have seen when entering the computer room. The small rectangular doors on the lower bay at the left hid the Williams-Kilburn CRT storage units. Photo courtesy of the NRC Archives. This photo shows both the main console and the power control panel. You will note from the right side of the photo that the floor is raised to allow wiring to be run between the various units. The main console. I believe the console operator is Rita Lahey but this has yet to be confirmed. The Creed photo-tape reader is on the left of the console and the Creed printer is on the right. 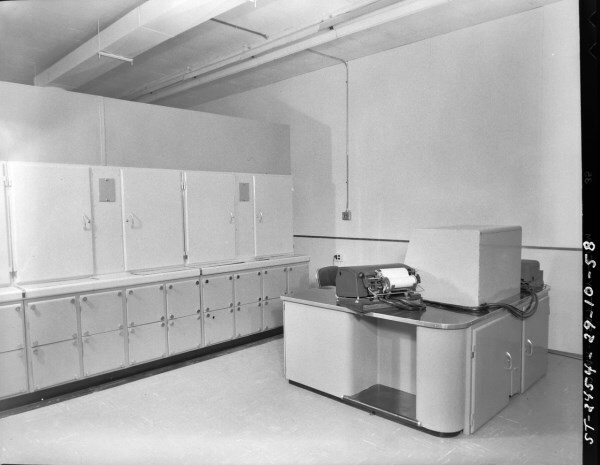 This area was to the immediate left of the main entrance to the computer room and was where users would input their data and program instructions that were punched out on paper tape. The open doors are for show only as they would have been closed when the machine was operating. This was the area between the two equipment bays.The open doors provide a good shot of just some of the almost 4000 tubes that heated up the room when running. The open area to the right is the magnetic drum memory unit. Also shown are the trusty Tektronix Model 545 oscilloscope and a well-used AVO tube tester. This final photo is of the spare magnetic drum memory unit. I only had to replace it once. (I’m thankful for small mercies!) It was a major reconstruction job to move all the electronics from one drum unit the other. Doing it once was more than enough. For more detailed information on Ferut, I highly recommend reading Chapter 3, The Ferut ERA, 1952-1955, from Scott M. Campbell’s thesis titled, “The Premise of Computer Science: Establishing Modern Computing at the University of Toronto (1945-1964).” You can view an abstract of Scott’s paper | here |. Another excellent resource on Ferut is Michael R. Williams article titled, “UTEC and Ferut: The University of Toronto’s Computation Centre” originally published in the IEEE annals of the History of Computing, Vol. 16, No. 2, 1994.